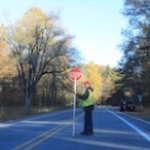 The 4-Hour Flagger Certification Spanish course covers safe flagging techniques as per New York State Department of Transportation and the National Safety Council. The topics discussed in this course include construction site safety, roadway safety, and the proper use of flagmen through an understanding of flagging procedures and proper use of required equipment. This certification is good for 3 years, as per OSHA.